The precious time of hospice care should be a meaningful period for everyone. If the quality of life of the patient is good, then everyone can relax more and endeavor to eradicate fear from daily life while enjoying time together. In human hospice care, one absolutely does one’s best to make quality of the life be the very best it can be, by whatever means available, and one never gives up or stops trying. In the world of animals, we have been given the powerful privilege of euthanasia to use if we, the guardians, see no other possible alternative. It must be the last resort. Perhaps, then, the basic interpretation of quality of life revolves around the discussion of natural dying and euthanasia. It seems that often, as they try to decide upon whether to euthanize, people are very focused on quality of life. BrightHaven’s focus is simply a day by day mission to bring joy and healing. Therein lays the difference as in the early years of BrightHaven, many animals were euthanized as we, or our veterinarians, determined “it was time” to end their suffering. Our vision and views have vastly changed since those days, as we have reached a greater understanding of the circle of life, death and beyond. Now BrightHaven places great emphasis not only on quality of life, but also on quality of death or dying. Much has been penned on this controversial subject. A scale for better understanding of how to measure the quality of life has been developed by Dr Alice Villalobos. The scale comprises a list, called “HHHHHMM (pdf)“, which stands for: hurt, hunger, hydration, hygiene, happiness, mobility, and more good days than bad days. A score above 5 on most of these issues is acceptable in maintaining an end-of-life program. 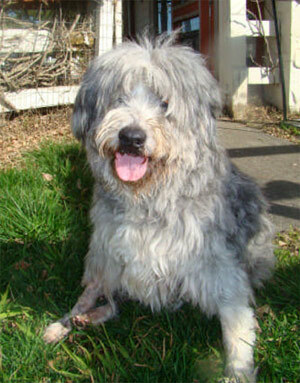 Dr. Alice very rightly says, too, that each pet’s situation needs an individual, kind and supportive approach. While using a scale can be tremendously helpful in your understanding, you are urged to add the other “H” to that list—that of “heart”—and follow your own! It may well be time to consider euthanasia, but it may also be a time to become proactive. Many veterinarians are not educated in the options for animal hospice care, as well as how to support the dying process with regard to pain management and quality of life. You are urged to pause to explore the possibilities for an alternative route. BrightHaven did, and found many, leading to the creation of the Quality of Dying Checklist! Poor quality of life does not necessarily translate to “I want to die.” My own mother received hospice care here at home at BrightHaven for many months, and this has proved a true education in this aspect. My mother had always wished to be allowed to die at home and to have no intervention to try to save her life. She felt a long time ago that she would prefer to escape her daily pain or acute incident if and when that time came. When that time did come, several times over, she became desperate to live at any price. Life is precious and we all try to keep it for ourselves as long as possible. The will for survival is huge. To our thinking at BrightHaven, this is a place where the worlds of animal and human hospice could better align. When our animals’ quality of life does not match our wish for them it is often hard for humans to bear; however, perhaps one should try to think beyond. Many older humans, and often younger ones, too, may not have what we would deem a good or great quality of daily life and yet we do not euthanize them—we simply seek to bring them more joy, and very often can and do. Some actually express their joy and bring it to the world. Christopher D’Olier Reeve (September 25, 1952-October 10, 2004) was an American actor, film director, producer, screenwriter and author. He achieved stardom for many acting achievements, but became most well known for his portrayal of the fictional superhero Superman. I am proud to say that I often met Chris in the course of my duties back in our English life! 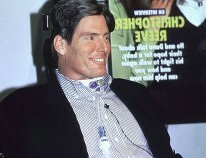 On May 27, 1995, Reeve became a quadriplegic after being thrown from a horse in an equestrian competition in Virginia. He required a wheelchair and breathing apparatus for the rest of his life. Christopher lobbied on behalf of people with spinal cord injuries, and for human embryonic stem cell research afterward. He founded the Christopher Reeve Foundation and co-founded the Reeve-Irvine Research Center. 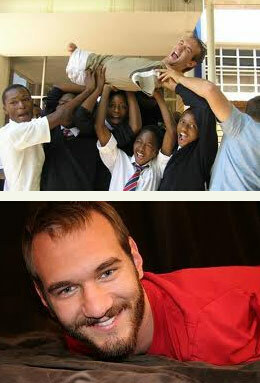 Meet Nick Vujicic, pronounced ‘Vooy-cheech’. Born in 1982 in Brisbane, Australia, without any medical explanation or warning, Nicholas Vujicic came into the world with neither arms nor legs. Imagine being born without arms. No arms to wrap around a friend; no hands to hold the ones you love; no fingers to experience touch; no way to lift or carry things. How much more difficult would life be if you were living without arms and hands? Or what about legs? Imagine if, instead of no arms, you had no legs. No ability to dance, walk, run, or even stand. Now put both of those scenarios together… no arms and no legs. What would you do? At 28 years old, this limbless young man has accomplished more than most people accomplish in a lifetime. Nick recently made the move from Brisbane, Australia to California, where he is the President of an international 501c3 non-profit organization, Life Without Limbs. Animals often live for years in similar situations. No, their quality of life may not be what we most wish for them, but if they can find joy or love in their days, then who are we to take precious life away from them? Why kill our animals when they cannot get well again and are headed in the natural direction of their end of life anyway, as designed by Mother Nature herself? Perhaps it may be that we are considering a better quality of death, as well as the best possible quality of life! We have often heard said the words, “How can you see them lying there suffering, day after day?” Very often the answer is, “Are you sure of their suffering—or is it yours?” Very often suffering proves to be in the eye of the beholder and based in deep-rooted fear. BrightHaven has many examples of animals with poor quality of life as seen from our own perspective who have demonstrated extraordinary joy in daily life. Here are just two—please click to read their stories. We believe that the love, joy and passion for life as demonstrated by these animals will help broaden your perspective. 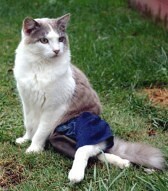 At the age of sixteen, she became bedridden for almost six years after a flea treatment caused neurological damage. Jackie could neither sit up nor walk. 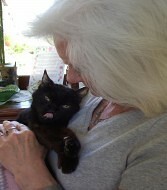 She suffered severe tremors throughout her whole body and had to be supported to eat her food—which she adored! Quality of Life at the End of Life. One wonders what else one should expect. Most often animals at BrightHaven remain full of love and joy and are pain free until their last minutes of life, but we will see a very gradual decline as appetite, movement and general daily activity cease or fail. These things are normal as Mother Nature helps prepare the body for its dying process. Certainly good quality of life is difficult to spot, but still one has to remember that dying is the aim at this stage—not living! Sometimes physical or medical changes will occur suddenly, without warning, and obviously veterinary support and advice would be required to best determine the situation. Do remember, though, that Mother Nature gave us all the gift of fainting or “stepping out” in acute situations, and beings may often step out of their bodies and return many times throughout their last days. This is quite normal.